The one… The only… The ….B…S!!!! RT Fitness does not supply a magic pill, a magic shake or even a magic meal plan… We are also not the only gym in the area… So what are we… Why would you choose us? We’ve got healthier, happier, more confident clients… For many it has become a way of life, it’s social, it’s fun and it’s informative. We have flexible time slots for whether you’re up with the larks, need to train before the kids wake up, need to train after work or if you work different shift patterns from one week to the next. We’ve always had a manual to go alongside our training programs but this latest edition tells you everything you need to know and the do’s and don’ts of getting to where you want to be. 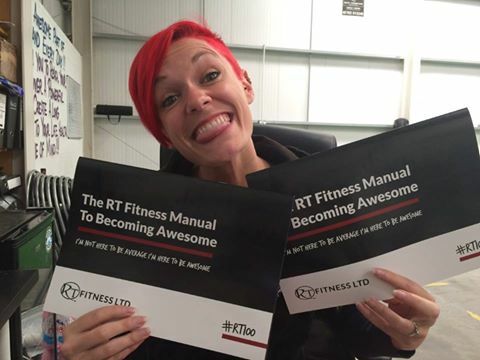 This manual is ONLY for our RT Fitness family and only they will ever know the secret to being awesome! This manual will guide you on your journey. What I love the most about RT Fitness is that we’ve got a community of characters who epitomise what I think life is all about! We live!!! We lift!!! We laugh!!! What more could you need? What more could you want??? We are quite simply the last thing you will ever try in order to get in shape.